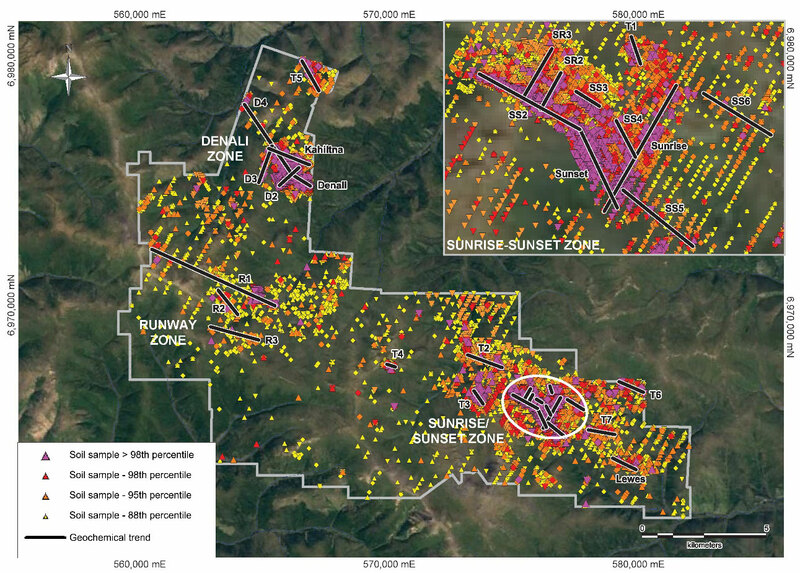 Independence Gold Discovers New Soi | Independence Gold Corp.
Vancouver, BC – Independence Gold Corp. (TSX.V: IGO) ("Independence" or "the Company") is pleased to announce the discovery of multiple new soil anomalies and the extension of known soil anomalies on the Company’s 100% owned Boulevard Project in the White Gold District, Yukon. The Company also completed nine diamond drill holes, totalling 977.5 metres (“m”). Drill results are still pending. The Boulevard Project now contains 25 distinct anomalous trends. This season Independence expanded the Denali Zone by extending the Kahiltna trend to 1.7 kilometres (“km”) and identifying the new D3 (1.5 km) and D4 (3.3 km) trends. The Company also identified the new Runway Zone, consisting of three trends, R1 (5.4 km), R2 (1.2 km) and R3 (2.2 km), as well as the newly named Lewes trend (1.0 km) previously announced on August 21st, 2017 (see Independence news release). The Company’s current soil trends, including those that comprise the Sunrise/Sunset Zone (which was drill tested this year), are outlined in the figure below. Anomalous trends on the Boulevard Project are identified by geochemical soil samples with greater than 75th percentile levels of gold, arsenic and antimony with values ranging from below detection in all three elements to 7,010 parts per billion gold, 6,730 parts per million arsenic and 1,325 parts per million antimony. This season’s program included the collection of 2,400 soil samples, increasing the number of soil samples on the Boulevard Project to 20,330. The Company’s internal proprietary database now contains approximately 46,500 soils samples across the White Gold District. All samples were submitted to SGS Minerals Services in Burnaby, BC for sample preparation by crushing to 75% less than 2 millimetres, creation of a 250 g split, and then pulverizing to 85% passing 75 microns. Sample pulps were submitted for gold analysis with a 30 g fire assay and AAS finish (code GE-FAA313). Samples were also submitted for a 52 element analysis using an aqua regia digest and ICP-AES and ICP–MS analysis (GE-ICM14B). Control samples (accredited gold standards and blanks) were inserted into the sample sequence on a regular basis to monitor precision of results. The Company announces the granting of incentive stock options to certain directors and officers to purchase up to 200,000 common shares under the Company’s Incentive Stock Option Plan. The options were granted for a period of five years commencing on November 2, 2017, exercisable at a price of $0.20 per share.